We share the mission to support Ontario college students. And with over 200,000 interactions with applicants each year, we know the importance of providing exceptional customer service. We also know that doing it right takes exceptional time and effort. By partnering on Tier 1 Customer Support, we help Ontario's colleges offload quick-resolution interactions, freeing their teams to focus on the deeper issues their students are facing. 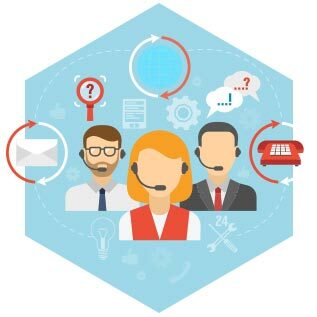 For smaller customer service teams, our service is a simple, cost-effective way to reduce call volumes, decrease wait times and continue to deliver the exceptional service their students deserve. "Our top priority is our students; they are at the heart of all we do. This [Tier 1] partnership has significantly improved their experience by reducing wait times during the busiest periods of the year." Let’s talk about how you can be the next to take advantage.